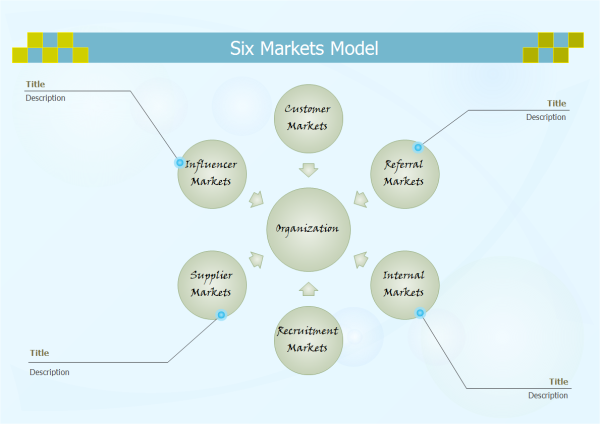 When you create a six markets model, one of the first things that you can consider is to start work from the six markets model examples. Now we will present some six markets model examples on six markets model for proper understanding of this diagram. Below is a sample six markets model example drawn with the Edraw six markets model maker. You can download and modify these six markets models for your own use. This template can reduce the amount of time to create great six markets model by using built-in symbols right next to the canvas. Discover why Edraw is an awesome maker to create six markets model. Try Edraw FREE.